Jose Guadalupe Posada (1852â€“1913) was one of Mexicoâ€™s most influential printmakers and illustrators. He produced an extensive body of imagery, from illustrations for childrenâ€™s games to sensationalistic news stories that appeared in a variety of inexpensive penny press publications marketed to the countryâ€™s growing middle and working-class. Posada is best known for his popular and satirical representations of calaveras (skeletons) in lively guises. These figures featured prominently on broadsidesâ€”cheap illustrated handbillsâ€”that were published for the Day of the Dead celebrations every November. Posadaâ€™s prints shaped generations of Mexican artists, among them the muralists Diego Rivera and JosÃ© Clemente Orozco. This exhibition features a wide range of prints and print media by Posada, fellow illustrator Manuel Manilla, and others, including calaveras, chapbooks, political prints, devotional images, and representations of natural disasters and popular events. 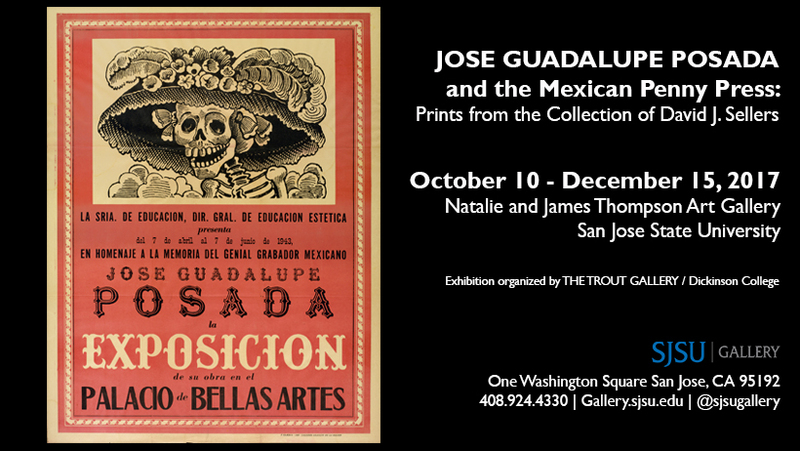 In conjunction with the opening of this exhibition, Guest Curator Diane Miliotes will conduct a presentation on the work of JosÃ© Guadalupe Posada and his contemporaries in Art #133 on October 10, 5:00pm-6:00pm. This presentation and the following opening reception, held immediately afterward in the Natalie and James Thompson Art Gallery 6:00pm-7:30pm, are free and open to the public.